^ Amazon's Jeff Bezos: With Jeremy Clarkson, we're entering a new golden age of television Retrieved August 18, 2015. ^ Amazon company timeline. Corporate IR. (January 2015). http://phx.corporate-ir.net/phoenix.zhtml?c=176060&p=irol-corporateTimeline. ^ World's Largest Bookseller Opens on the Web. URLwire. (October 4, 1995). http://www.urlwire.com/news/100495.html. ^ a b "Forming a Plan, The Company Is Launched, One Million Titles". Reference for Business: Encyclopedia of Business, 2nd ed. Retrieved September 1, 2012. ^ Spector, Robert (2002). Amazon.com: Get Big Fast. 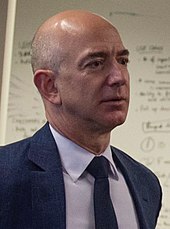 ^ a b "AMAZON.COM, INC. FORM 10-Q For the Quarterly Period Ended September 30, 2010"